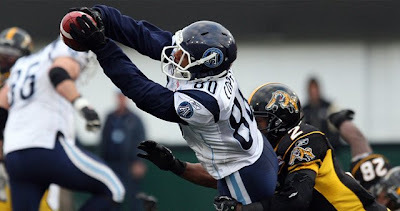 The Canadian Football League's Toronto Argonauts beat the Hamilton Tiger-Cats 16-13, November 14 @ Ivor Wynne Stadium, in the CFL East Division Semi-Final, carrying them to 10 wins this season and a shot at the Grey Cup. 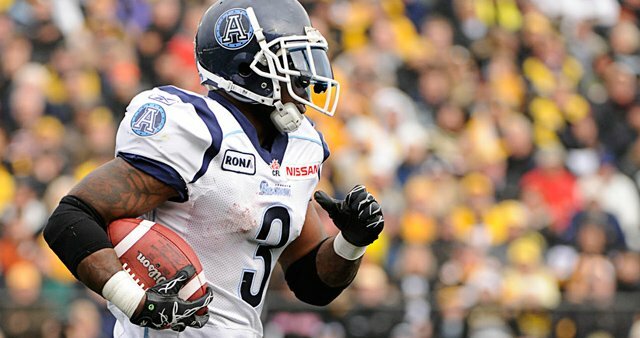 "They capitalized on our turnovers," said Ti-Cats kick returner Marcus Thigpen, who lost two fumbles on punt returns. Other Ti-Cat problems included a missed field goal from 17 yards and 10 penalties for 93 yards. 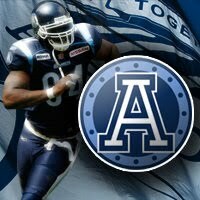 which led to Toronto's first field goal and eventual win. Argonauts coach Jim Barker is keeping the team inspired, as the players head to Montreal, November 21, for the 2010 East Final against the Montreal Alouettes @ Olympic Stadium.